Copenhagen urban cycling company Biomega has launched two versions of a city bike by Danish design supergroup KiBiSi with a glow-in-the-dark front fork and a mudguard integrated into the down tube. KiBiSi – the design group created by architect Bjarke Ingels, industrial designer Lars Larsen and design entrepreneur and Biomega founder Jens Martin Skibsted – based the NYC / New York city bike on Biomega's innovative CPH / Copenhagen design, but reengineered it to include functions that make commuting safer and more comfortable. While the CPH design features an unusual drive-shaft instead of the typical chain, the NYC bike takes the chainless cycling concept in a different direction with its carbon fibre belt drive that transfers power to the rear wheel. 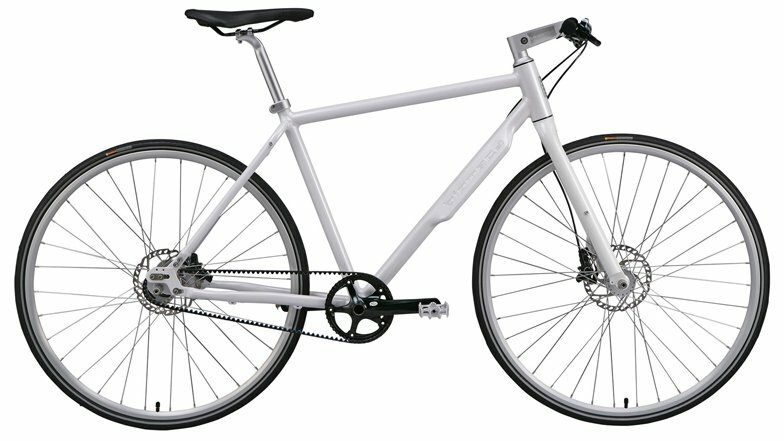 Originally designed in 2010, the NYC model features intelligent details such as gear and brake cables hidden inside the frame, which are used on Biomega's previous bikes and have helped establish the firm as a leading producer of functional and stylish city bikes. It will be available to the public for the first time in two gear speed and eight gear speed versions this summer. "The NYC / New York Biomega bicycle is thought of as the heir to my CPH / Copenhagen Biomega bicycle: no, chain, no frills diamond frame," said Biomega founder and KiBiSi designer Jens Martin Skibsted. "I can only think of a few classic bicycles where every detail has been so thoroughly designed. We simply put the bicycle back on the drawing board and detailed every bit of it all over again." Key features of the NYC design include an aluminium down tube with flanges on either side that create a built-in mudguard. The front fork is treated with a glow-in-the-dark paint that absorbs light during the day and emits it at night to supplement standard bike lights and offer a supplementary safety measure. The bike will be launched on 27 June at Copenhagen's Designmuseum Danmark and presented at international cycling fairs Eurobike and Interbike in September. KiBiSi has previously collaborated with Biomega on a radical bicycle concept for fashion brand Puma, featuring an extendable baggage rack. The studio has also designed a magnetic bike light that turns on when the two halves are snapped together around the bicycle's frame.